Previously we have already talked about how an ambitious 6 million euro project would restore the massive Mausoleum of Augustus (watch its 3D reconstruction here). But this time around, beyond mausoleums and tombs, researchers over at New York’s Metropolitan Museum of Art have taken a go at the reconstructed portrayal of Caesar Augustus himself. As one can comprehend from the above picture, the depiction rather follows a seemingly curious route with Augustus showcased in his Pharaoh avatar, while the entire artwork is incredibly ‘remastered’ in dynamic vibrant colors. Now pertaining to the latter factor, many ancient Egyptian engravings and murals originally did have colorful images and figures that flaunted their nigh ‘psychedelic’ level of vivacity. In fact, the Egyptian penchant for both vibrant and subtle colors (and more importantly their effects on the viewer) can also be evidenced from the casing stones of the Great Pyramid. These smooth stone surfaces were polished to such a degree that the pyramid shone like a glass when viewed from a distance. Furthermore, in spite of many such hues and tints being lost due to over millenniums of flooding and the rigorous desert sandstorms, historians have some ideas about the measures of vibrancy favored by the Egyptians, by virtue of the early studies done by explorers such as by Britain’s Aylward M. Blackman (and his invaluable sketches and diagrams). As for the Pharaonic flair of Augustus himself, this particular depiction was found on the outer sandstone wall of the Temple of Dendur, a monumental structure built in 15 BC, by a Roman governor named Petronius. The engraving also showcases two additional figures – the Egyptian god of the sky, Horus, and love goddess Hathor. On closer inspection, one can comprehend that ‘Pharaoh’ Augustus is cordially offering wine to these gods of Egypt – a trope that rather advocated how the Roman emperor was now the sole claimant to the Egyptian realm. We consulted nineteenth- and early twentieth-century surveys that reported on other temples as well, specifically the Napoleonic Description de l’Egypte, which included two temples illustrated with color. The two illustrated temples were the Temple of Isis at Philae and the Temple of Hathor at Dendera, both of which had recently been cleaned, revealing brilliant paint. 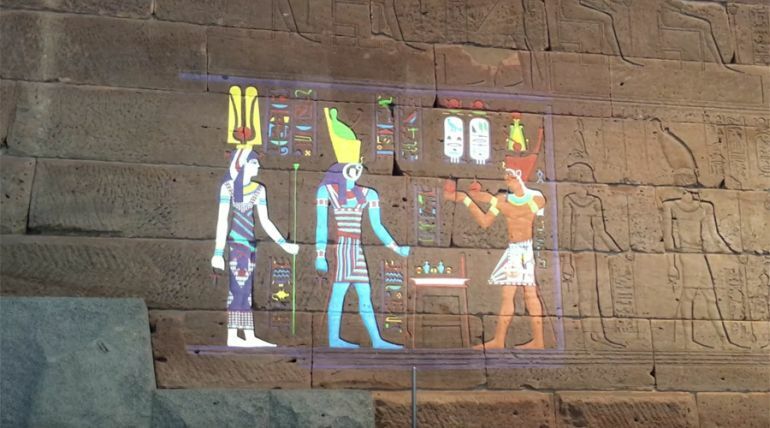 The inner portion of the portico at the Temple of Hathor dates to the same early Roman period as Dendur, so it served, along with Blackman’s record, as an example that helped us choose the colors for our digitally recreated projection. Interestingly in 1965, the entire Temple of Dendur was gifted by Egypt to United States, in recognition of the American assistance that helped in the saving of various other monuments threatened by the Aswan High Dam construction. So the temple was disassembled piece-by-piece (with the largest components weighing more than 6.5 tons), packed in over 661 crates, and safely transported across the sea all the way to United States. The monument was finally awarded to The Metropolitan Museum of Art in 1967, and then successfully installed in the Sackler Wing in 1978. 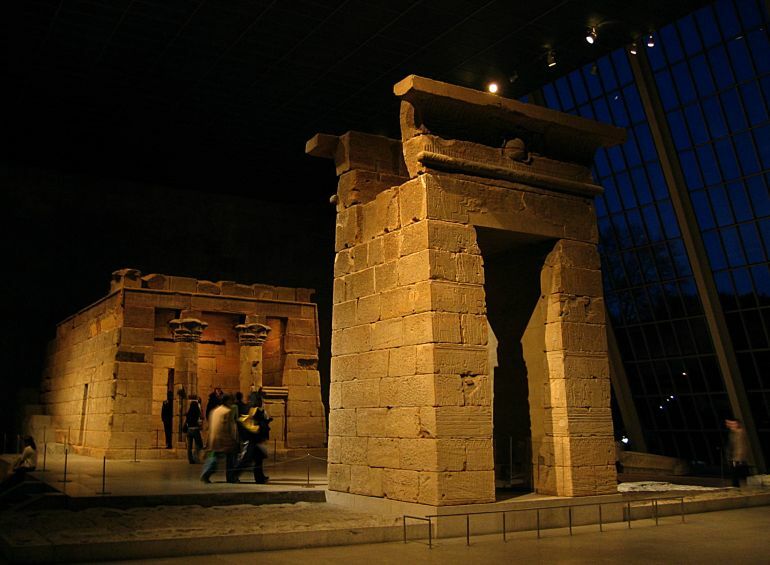 The Temple of Dendur in its current location inside the Met Museum.